Denise and Gallit have developed a Creativity Rubric that they use in Step 3 of their Genius Hour cycle with students. It’s a work in progress, but you’re welcome to use, tweak and/or share! Here’s what it looks like. This is the first of two pages, so be sure to click one of the links at the bottom to download/access the complete rubric. Download an MS Word version of this rubric or go to Google Doc. The Genius Hour Guidebook: Passion, Wonder and Inquiry in the Classroom is co-authored by Denise Krebs & Gallit Zvi and published by Routledge Eye on Education, in partnership with MiddleWeb.com. Learn more about the book. Really keen to learn more about how to integrate genius hour into a curriculum so that the learning is deep and meaningful. 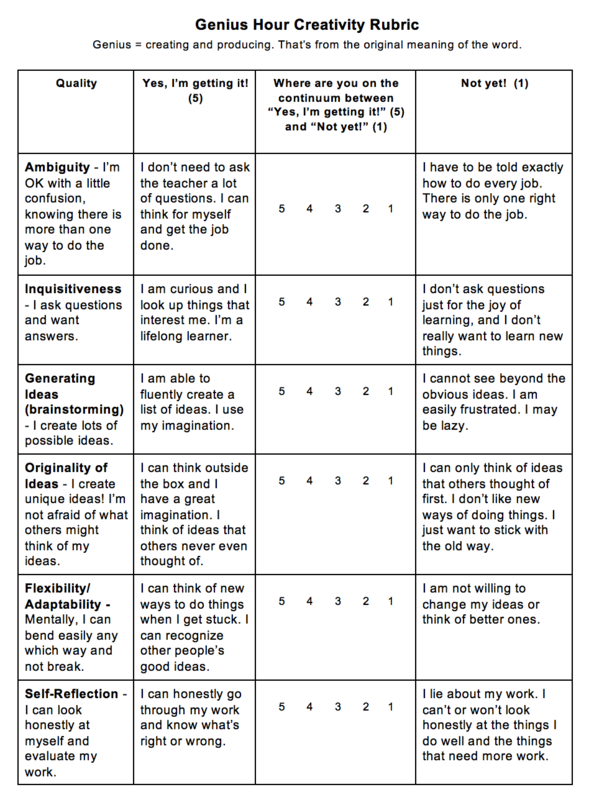 I’ve used a slightly modified version of this rubric for genius hour with my students. It’s really helpful! I have used a variation of this rubric with my students for a genius hour. It is a useful tool for them to assess themselves. As per the comment above. I really like the term “innovation time”. I call the class with my Grade 8s Genius Hour and I don’t feel we are living up to that challenge. : ) They have difficulty forming deep questions, and I have to admit, I do too. Often they end up just trying new things. A new way of videography, a new recipe, building something, researching something that interests them, but we have yet to really get that structure of having deep questions, researching, and presenting. I do feel that the questions and reflections are what we need to work on. Kate, I agree that asking probing questions is difficult work. I think we all have trouble inspiring that work in all the students. (Actually, even in myself, if I’m honest.) We are building problem solvers and critical thinkers who, in the future, will be finding and solving problems we don’t even know about yet. It’s worth letting them struggle through it. I know there are so many names for this kind of learning. What if you let the students help you decide what to call it? Finally, anyone who is familiar with AJ Juliani’s blog and work should check it out. He works with older students, high school, and features invaluable resources that he shares for free. I am truly indebted to him. Thanks for the comment and question. I hope others will respond. I know Angela is supporting Thrively as a safe place for students to connect, discover and share their passionate projects. I have not had a chance to use it yet, as my present students are young and just learning English. Thanks for sharing AJ’s blog. He is a gifted contributor! How he writes so prolifically, works as an administrator, and has a growing young family at home is amazing! Thanks for joining the conversation here! P.S. Is your blog not shared publicly? The name is intriguing, but when I clicked, it won’t let me go to it without logging in, which, of course, I can’t do. I would like to visit it if it’s a possibility. Ok, I need to do some more reading. I value each of these qualities, but I’m not certain that they’re (exactly) the ones I’d be focusing on through Genius Hour. Problem solving and collaboration would probably be right up there. Jeremy, I agree! I believe this rubric should be constantly revised and updated based on the students and their needs. Actually, they should revise and update it themselves so they have ownership. We should teach them to identify the skills and qualities in which they may be lacking and then teach them to work on those. I love this rubric! The level 1 examples made me smile. I have some students that I know are level 1 in some areas, and others who are getting close to 4-5. It would be interesting to see where they rate themselves. This is a great tool! Thank you everyone for sharing your wonderful comments…it is so great to hear what is going on in different classrooms! FYI…sometimes when I have used the rubric with my students, we have focussed on just 1-3 areas at a time…I let the kids pick which they want to focus on. I would love to hear about/read any blog posts any of you have written about how you have used rubrics (this or other ones) during Genius Hour! Please share links here or on twitter (#geniushour). Thanks & Happy New Year! This is my 23rd year and I’m so glad I’ve now jumped into Genius Hour! This is very handy to help learners understand what is important. I teach 9 – 10 year olds in North Vancouver. I’m interested in the notion of originality. Don’t we all stand on the shoulders of others? In other words, do we expect too much if we measure whether students will regularly come up with original ideas without benefit of others? I think I’ve only had perhaps half a dozen original ideas in my life and, yes, they were amazing breakthroughs for me in solving the problems at hand at that moment, but still, that’s few and far between. Do kids regularly generate original ideas? Is this partly a learned skill do you think? This is a great comment. I think you are right on target about originality. Kids don’t generate purely original ideas in my experience. However, some of my students did show a lack of originality (or something) when after a round of Genius Hour, they would do the same Genius Hour project as someone before them. We all definitely re-create more than originate, and that’s OK, but I would try to challenge those students to take it to another level or make a twist on the project their peer did before them. I wonder what word you would choose for that quality of standing on the shoulders of those before us, using their good ideas, and taking a step further or higher, as it were? I’m always telling people when I share this rubric that it should be re-created to meet the needs of your students. After doing Genius Hour for a couple of rounds, my students (ages 12-14) actually brainstormed what these qualities would look like and helped me write this rubric for them to use as a self-assessment tool. I encourage all teachers to do the same. Brainstorm with your students what it is you want to assess and then let them create a rubric. Jeremy mentioned above that there are some skills he would add — problem solving and collaboration. Are those “creativity” skills too that are missing from this rubric? I see how it needs constant updating. Thanks for the challenge. I hope you will stop by and share what your students create and use as a rubric. Thank you for sharing this rubric. I really like the continuum format and you’ve included some areas I hadn’t thought of before. I particularly like the Adaptability/Flexibility section. This really is an essential component when working on Genius Hour projects! Thanks for the rubric. Great way to self-assess at beginning, middle and end.